“I called up Easy Breeze Cooling. They were promptly out here, very affordable, very hot as you can see. Sweating, but they got the AC working right now. It is nice and cold in there. Mr. Ewing is a great technician. I’m proud that I called them. — with Harold William Ewing II. — with Harold William Ewing II and Scott Goss. – Licensed (We’ll get the permit For Your Project – Peace of mind). – Insured and Bonded (Insurance Certificate Issued For All Projects). – 100s of Solid References. – 5+ years of experience in the Air Conditioning Industry. 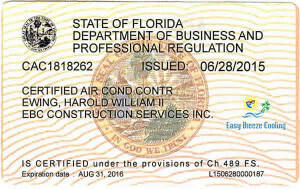 – Florida Legal Corporation (FEI/EIN Number 27-3190307). – I will Supervise/execute each and every project. You can see the picture and videos from the me all over the web. We are completely accountable/responsible for every action we take. Here are a few of our services we provide.